This article is about the quest. For the item, see Rjorn's Drum (item). Retrieve a drum for Giraud Gemane. 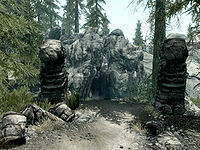 What happened in Halldir's Cairn? Once you have completed the Bards College initiation quest Tending the Flames, the Dean of History, Giraud Gemane, will start saying: "They found it! They actually found it!" When asked what 'they' found, he will explain: "Rjorn's drum! Nobody knows where he died, and therefore where his drum might be. Halldir was the missing link. 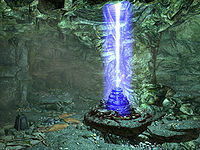 Rjorn entered Halldir's Cairn in secret, and presumably died there. Now all I need to do is find someone to get it. Wait. You. You could do it. I need you to get me that drum." He then proceeds to explain why the drum is worth going through the trouble, as Rjorn was the most famous battle drummer of the second age and the drum itself was used at half a dozen famous battles. He finishes with: "Rjorn was always looking for new stories to tell. It seems he was writing a lay about Halldir when he vanished. That was the missing clue." Although the task sounds quite dangerous, Giraud will then resume to his usual routine while it is up to you to track down the drum. "Never thought I'd see the day we were run out of the Knifepoint Gang. Least the storm should cover our tracks. Vidgrod, Raen, and I took shelter in a cave for the night. Looks like there's an old ruin here. Least there are no Draugr around." Unlock the iron door to the southwest and head up the spiral staircase. Pick up the various soul gems along the way and head west at the intersection. As you approach the wooden door, two ghosts will attack you, so dispose of them and unlock the door. You will enter some catacombs, with another ghost getting up from a throne as you approach. Head up the western set of stairs, past the bone chimes, to another tomb, where draugr enemies will start to rise from their graves, along with more ghosts. A pedestal holds a useful copy of the spell tome Raise Zombie, while the handle to raise the iron bars is found behind the throne. "Something's wrong. Raen hasn't said a word since she woke up this morning, just keeps staring off into space. Vidgrod isn't much better. They sick? Not like any illness I ever heard of. I'd just walk out on them, but I can't seem to get up the nerve. I feel like something's holding me back. What is this place?" "We're not alone. I can hear him now. Someone, speaking in my mind. Old. Powerful. Halldir, that's the name. He wants something from us. Needs us to stay for the magic to work. I tried to run, can't. Just like them." "Raen jumped first. Onto the cairn. That's what Master wants - blood, sacrifice, power to live again. His magic, I can feel it pulsing in my blood. He's draining us. We'll serve him soon, our bodies, our souls. Just like the others. They're waiting. It's my turn." Return to Solitude and find Giraud Gemane. When you show him the drum he will be overwhelmed with joy: "At last! I have searched for this drum for 20 years. The college treasury is a bit thin right now. But I can show you some tricks I learned from my days with the army." He will then raise all your Combat skills by one point in return. This includes Archery, Block, Heavy Armor, One-handed, Smithing, and Two-handed. 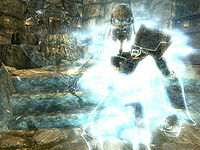 It is possible to sneak in slowly and kill Halldir using a sufficiently powerful bow attack just as the draugr-form appears. This will bypass the fight with Halldir and his clones. After you turn in the quest, the drum will remain in your inventory, still marked as a quest item. If Giraud Gemane dies before receiving the drum, it will remain in your inventory as a quest item. ? The drum can be removed from your inventory with the console command player.removeitem daba9 1. If you find the drum before activating the quest, it will not be marked as completed even after returning the drum. After killing Halldir, if he dropped his staff, you can get two copies by looting his remains and picking it up off the floor (either order). The pillars for the rune totem puzzle may not move when activated. ? In Skyrim Special Edition, instead of splitting himself into three clones, Halldir sometimes just disappears. The player is left locked in the room with the drum but no staff and no way of opening the exit. ? On the PC, it is possible to use the console to advance through the quest by entering setstage BardsCollegeDrum stage, where stage is the number of the stage you wish to complete. It is not possible to un-complete (i.e. go back) quest stages, but it is possible to clear all stages of the quest using resetquest BardsCollegeDrum. This page was last modified on 20 May 2018, at 17:01.